Update 1/14/19 – Unfortunately, we have had to cancel the event as we did not make the minimum number of ticket sales. You can choose to donate your ticket price to the the grant fund or FHS Program of your choice or you can request a full refund. You will receive an email or message soon regarding this and asking for your response. Please take a moment to give us your feedback to help in planning next years Casino Night. Casino Night is an Adult Community Event sponsored by the FHS BOOSTERS to raise money for all the student programs it supports. Casino Night is held annually on “Super Saturday” the Night before the Super Bowl. The night typically includes: food and beverages, casino gaming tables, drawings and a silent auction. Date: Feb 2nd, 2019 – CANCELED! The Booster Club has been working hard on getting everything set for Casino Night. Take a look at all that we have planned and the amazing Prizes and One of a Kind Silent Auction Items. Come back often for updates!! Look ahead for real time online bidding from your phone and many fabulous items! We are currently seeking one more company to sponsor our Super Saturday Casino Night. With a $500 donation your company will be listed as a sponsor for the event Your logo will appear on flyers, posters, and electronic announcements of the event. Your company will be announced at the event. 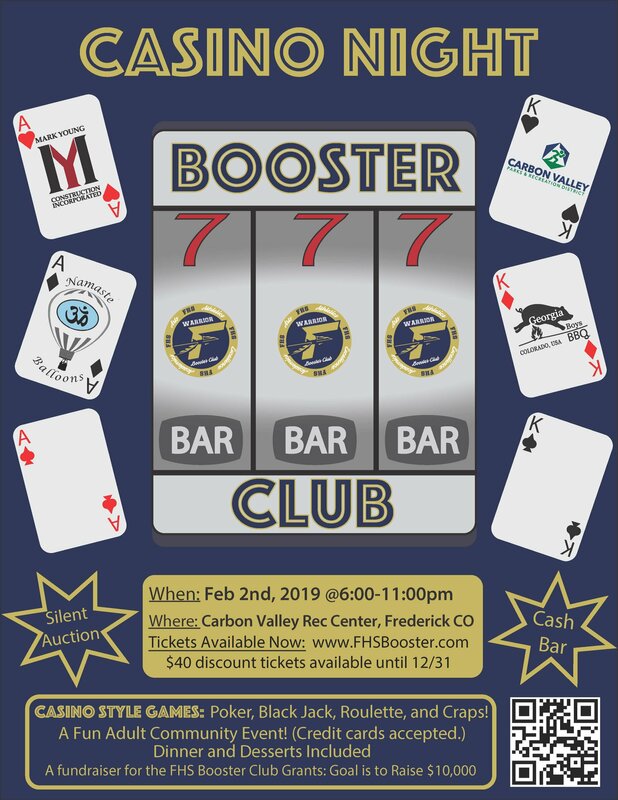 FHS Booster Club is offering all FHS clubs, Teams and organizations the opportunity to participate in the Casino Night Ticket Fundraising Program. Using Social media and emails to reach family and friends – your organization can sell tickets (online) and your organization will earn money for each ticket sold. The big thing here is that the PARENTS ( not the kids) will share and invite their friends to come out to the Super Saturday Casino Night and to go online to buy the tickets. This is NOT a door to door type of sale. Simply the parents will share the invite over social media and word of mouth and the tickets will be purchased online. The ticket purchaser will state who they are affiliated with and that team/club gets credit for the sale. Here are the links to the informative letter, the registration form, the flyer, and a draft email (please be sure to personalize the letter before sending it out. Super Saturday Casino Night is a really fun night just for our adults in the community. Spread the word, invite your friends and your program can raise some money.